I just love the two Ronnies and this video with one of them is perfect, so clever, made me laugh out loud. Another day I'll post the two R's in the same shop, that's a scream, too. And Remarc, I just flicked back to your post at #821, it is great. Norwegian Icebreaker to clear the Hudson River for freighter traffic. The Icebreaker is starting near Tarrytown and working its way northward. Here is a picture as the hard work of ice breaking begins. Impressive! Ouch - let's hope his chopper doesn't get frozen up. 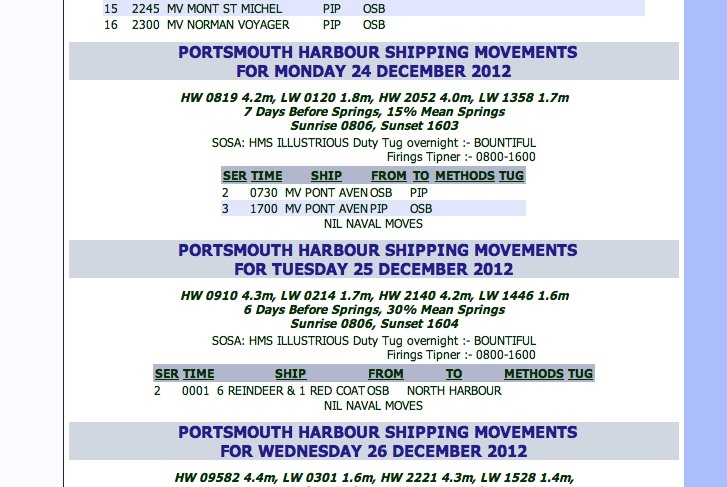 Thought you may also enjoy the Portsmouth Port Movements, as published on the Queen's Harbour Master website (www.ghm.mod.uk). Have a look at December 25th. Te-he! Me like. I do love it when even offialdom allows itself a mild smile. That guy is in many so very much the same kind of person as me... people love scaring me too, and I also appreciate people being happy, smiling and make a life around themselves at work. 1. Sometimes I'll look down at my watch three consecutive times and still not know what time it is. 2. Nothing worse than that moment during an argument when you realize you're wrong. 4. How the hell are you supposed to fold a fitted sheet? 5. Map Quest really needs to start their directions on # 5. I'm pretty sure I know how to get out of my neighborhood. 6. Bad decisions make good stories. 7. I think the freezer deserves a light as well. 8. I disagree with Kay Jewelers. I would bet on any given Friday or Saturday night more kisses begin with a ****tail than Kay. The Norwegians are out in the sun, getting a tan. The Norwegians plant flowers in their gardens. The Norwegians are cruising in cabriolets. The Norwegians have their final barbeque before winter. The Norwegians start using long sleeves. The Norwegians end their Midsummer celebrations. People in Greece die from the cold and disappear from the face of the earth. The Norwegians start drying their laundry indoors. The Norwegians stand in line at the hotdog stands. Polar bears start evacuating the North Pole. The Norwegian army postpones their winter survival training awaiting real winter weather. 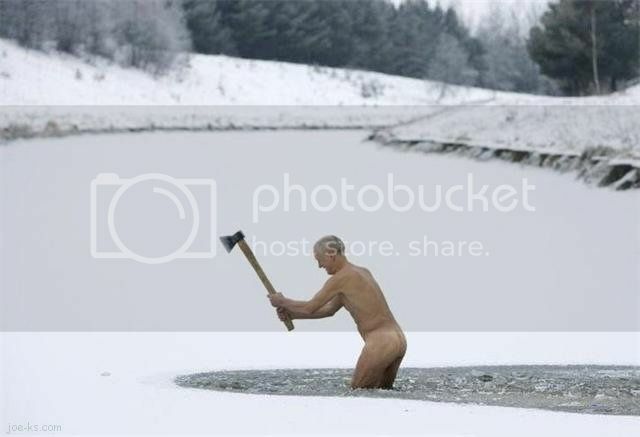 The Norwegian army goes out on winter survival training. The Norwegian cows complain that the farmers' hands are cold. Norway wins the Eurovision Song Contest. 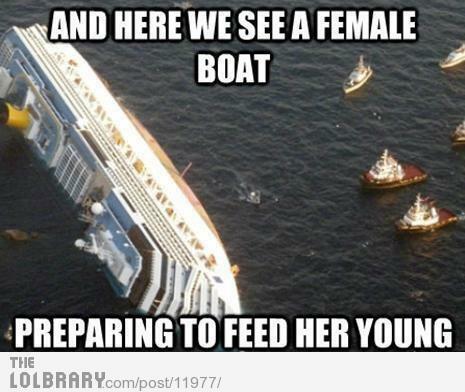 I got this in my e-mail a few days ago... it's very funny! Further down the road Little Red Riding Hood sees the wolf again; this time he is crouched behind a tree stump. "My, what big ears you have Mr. Wolf," says Little Red Riding Hood. Again the foiled wolf jumps up and runs away. With that the Big Bad Wolf jumps up and screams, "Will you get lost? I'm trying to take a dump!" A woman walks into a city train, see something funny on her smart phone..., and starts laughing. Last edited by Sterkoder; January 31st, 2013, 22:05.